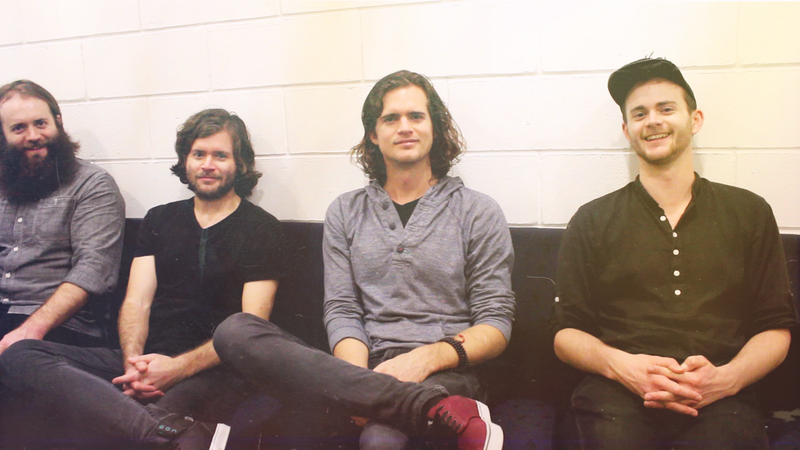 Entrevista aos Kongos | Watch and Listen! À conversa com os Kongos. Antes de abrirem o concerto dos OneRepublic, estivemos a falar com os Kongos sobre a primeira coisa que fazem quando visitam um país pela primeira vez, como é andarem em tour com bandas como os Kings of Leon e os OneRepublic e ainda deixaram uma mensagem para os fãs portugueses. Before opening for OneRepublic we talked to Kongos about the first thing they do when they visit a new country for the first time, how is it touring with bands like Kings of Leon and OneRepublic and they also left a message for the portuguese fans. Vocês viajaram por todo o mundo. Qual é a primeira coisa que fazem quando visitam um país pela primeira vez? Jesse: Trocar dinheiro, não sei. A maneira como viajamos normalmente vamos para a carrinha até… é um bocado lamentável. Estamos fora e dentro de uma cidade quase uma cidade um dia por isso não vemos muito, mas quando temos um dia de folga a primeira coisa que tentamos fazer é comer! Ir encontrar algo, comida local ou experienciar a cultura dessa forma. Dylan: Andar! Nós gostamos muito de andar… vês muito. You have travelled all around the world? What’s the first thing you do when you visit a new country for the first time? Jesse: Get money changed, I don’t know. The way we travel usually we leave for the van at least… it’s kind of unfortunate. We are in and out of every city almost one city one day so we don’t get to see that much, but when we have a day off the first thing we try to do is eat! Going and found something, local food or experience the culture in that way. Dylan: Walk! We like walking… you see so much of it. Conseguem escolher a vossa música favorita do vosso álbum de estreia, “Lunatic”? Dylan: É provavelmente diferente para cada um de nós. Nós gostamos muito de tocar a “I Want to Know” ao vivo, mas depende mesmo do concerto, do dia. Às vezes tens uma preferida, às vezes não gostas de tocar essa música ou ouvi-la. Jesse: É como escolher um filho favorito. Johnny: Eu gosto das que escrevi. Can you choose your favorite song from your debut album, “Lunatic”? Dylan: Probably different for each of us, you know. We like playing “I Want to Know” a lot live but it really depends on the show, depends on the day. Sometimes you have a favorite sometimes you don’t like playing that song or listening to it. Jesse: It’s like choosing a favorite child. Johnny: I like the ones I wrote. Como é andar em tour com bandas com os Kings of Leon e os OneRepublic? Dlyan: É incrível! Podes tocar para multidões enormes e és exposto a muitos fãs todas as noites e também o tipo de luxo de se andar em tour com grandes bandas é tudo fora do palco. O catering, os camarins (apesar deste não ser tão chique como os outros). How is it like touring with Kings of Leon and OneRepublic? Dylan: It’s incredible! You get to play to such huge crowds and get expose to so many new fans every night and also the kind of luxury of touring with a big band is everything else off stage. The catering, the dressing rooms ( although this is not as fancy as the other ones). Têm alguma mensagem para os vossos fãs portugueses? Jesse: Sim, mal podemos esperar para vos conhecermos. Estamos muitos felizes por estarmos um bocado a sul da Europa porque passámos muitas semanas na Alemanha e na Suécia onde não há sol e foram concertos bons e tal, mas há uma vibracidade dos fãs pelo que percebemos em Espanha, Portugal e Itália. Estamos muito animados por estarmos aqui. Dan: E gostamos muito do pão. É bom. Do you have any message for your Portuguese fans? Jesse: Yeah, we can’t wait to meet you. We’re just so happy to be a little bit south in Europe because we spent so many weeks in Germany and Sweden where there’s no sun and it were great shows and everything, but there’s a vibrancy to the fans from what we can tell in Spain, Portugal and Italy. We’re very excited to be here. Dan: And we really like potato bread. It’s good. No final da entrevista, fizemos um jogo com a banda onde dissemos o nome de alguns artistas e bandas e pedimos para nos responder com "Come With Me Now" ou "Don't". Vejam o vídeo no link em baixo. At the end of the interview, we did a game with the band where we said a few names of artists and bands and they replied with "Come With Me Now" or "Don't". Watch the video below.